By taking “Smart City” as a key topic, INTERGEO 2016 is focussing on a multi-faceted issue that will shape the future. The preview of the leading international event for the geospatial community in Hamburg was attended by renowned experts from industry, science and public authorities. During their discussions, all were agreed that cities must and will become more intelligent – not because that is a natural consequence of digitalisation, but because it benefits society. Intelligent geodata is a crucial prerequisite for any such development. In April 2016, the patron of INTERGEO, the DVW German Society for Geodesy, Geoinformation and Land Management, gathered together experts from the worlds of business, public authorities and science to talk about this year’s key topic – “Smart City”. 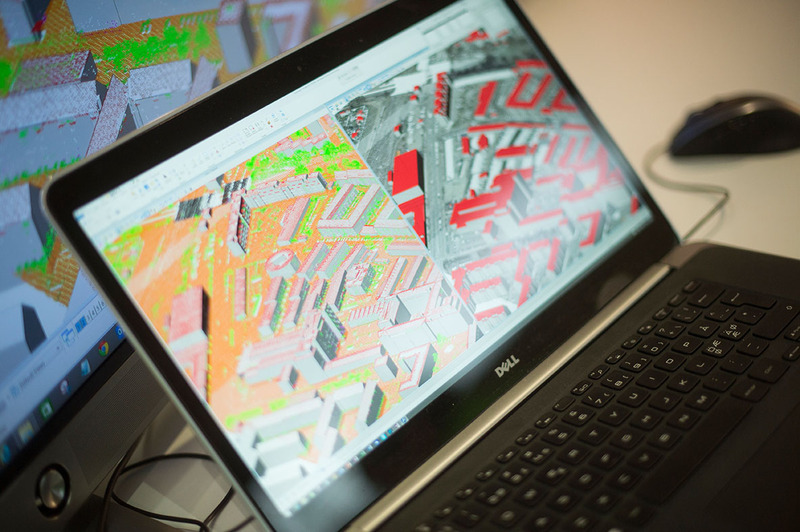 The event, which was held at Hamburg’s Agency for Geoinformation and Surveying, centred on issues such as what an intelligent, digital city might look like and what role geoinformation would play as cities and metropolitan regions become “smart”. The range of participants in the preview couldn’t have been more varied and yet they all agreed on one common denominator. Jörg Amend from solutions provider Trimble Germany GmbH, Dr. Chirine Etezadzadeh from the SmartCity.institute, Rolf-Werner Welzel, Managing Director of Hamburg’s Agency for Geoinformation and Surveying, Sebastian Hetzel from the Hamburg Traffic and Road Network Authority and Prof. Thomas Kersten from HafenCity University Hamburg agreed that the increasing penetration of digital technologies into cities is not an end in itself. First and foremost is the common good of society and the advantages that digitalisation offers inhabitants. This will ensure that cities can be run on a more intelligent basis and thus become a sustainable living space. The preview participants felt that smart geodata was an essential prerequisite in this regard. As the host city for INTERGEO 2016, Hamburg is leading the way in Germany when it comes to the “Smart City” and has been quick to position itself with “Hamburg’s Strategy for the Digital City”, which aims to develop a standardised smart city strategy. Key areas include mobility, energy, business and work, accommodation and city life. What’s more, the city’s residents are also to be involved in the strategy. The process for establishing an intelligent urban infrastructure starts with taking stock of the current situation and describing the vision for a smart city, then goes on to deal with the roll-out of intelligent solutions for the individual segments – all of which is naturally done in dialogue with residents, politicians, administrators, business people and scientists. Taking traffic as an example, smart mobility concepts are designed to improve the flow of traffic so as to minimise the delays caused by congestion while also lowering CO2 emissions. The overarching goals for an intelligent city are at the heart of this approach, namely improving the environment – particularly air quality –, achieving climate goals, supporting business by keeping traffic moving and creating a healthy environment and a work/life balance for inhabitants. Measures include intelligent transport systems, semi-automated vehicle guidance, sharing concepts, intelligent parking facility management, apps for inhabitant participation and city planning processes (such as smart working areas on the outskirts of the city) that help to avoid traffic in the best-case scenario. Everyone at the preview agreed that a standardised language must be developed and understood if forward-looking, complex processes such as the development of an intelligent digital city are to be successfully rolled out. The huge dynamic behind digital advances and the enormous challenges related to burgeoning cities around the world are forcing those responsible to take action. Nowhere has knowledge and action for planet Earth been more consistently and more emphatically in focus than at INTERGEO, the leading international trade fair for geodesy, geoinformation and land management. “Smart City” is the perfect key topic for INTERGEO, which will draw movers and shakers from business, science and public authorities to Hamburg in October 2016. Visitors can look forward to meeting exhibitors who are laying the foundations for the Smart City and can explore a broad-based conference program that centres on the challenges facing intelligent cities. The first edition of INTERGEO News also reports about the Preview from May 5th on its newly launched platform www.intergeo-tv.com. INTERGEO, which consists of a conference and a trade fair, is the world’s largest event for geodesy, geoinformation and land management. It is held every year at different venues in Germany. The conference deals with current issues from politics, administration, science and industry, and had around 1,200 participants. At last year’s leading trade fair, more than 16,500 visitors from 90 countries discovered the latest innovations from 549 companies from 30 different countries. INTERGEO’s continuing aim is to facilitate process optimization in numerous target markets with the geo-IT potential it showcases. Its forthcoming venues are the internationally renowned exhibition cities of Hamburg in 2016, Berlin in 2017 and Frankfurt am Main in 2018. INTERGEO 2016 will be held in Hamburg from 11 to 13 October. DVW – German Society for Geodesy, Geoinformation and Land Management is the host of INTERGEO.